The latest funding opportunity puts an emphasis on early-stage research and improving solar integration on the grid. The U.S. Department of Energy announced $105.5 million in new funding on Tuesday to support innovative solar research in four core areas. The latest funding opportunity, offered under the DOE's Solar Energy Technologies Office (SETO), reflects a priority shift from later-stage commercialization to early-stage research. It also represents a shift from focusing exclusively on driving down the cost of solar, to improving the affordability, flexibility and performance of solar on the grid — with the largest portion of funding aimed at solar systems integration. The program launch comes now that the federal budget has been squared away for 2018. It follows a DOE announcement in January aimed at backing U.S. solar manufacturing and a funding opportunity announced in December aimed at supporting solar forecasting. Charlie Gay, director of SETO, echoed that reducing solar costs remains a priority for the DOE, but noted that the methods of cutting costs have changed as the market has matured. He added that combining energy efficiency with the ability to manage load profiles will help advance the adoption of PV on the distribution system. The integration of sensor technology to better understand what's happening on the grid will also be beneficial for the broader electricity sector as more solar comes online. "The success of getting costs down means that we have to work together with a whole lot of other stakeholders to get the momentum we want to continue [in bringing costs down],” said Gay. In the Advanced Solar Systems Integration Technologies category, funding will be used to support advances in power electronics, solar-plus-storage, and PV-integrated sensor technologies. This work "will help ensure a smooth transition to a secure, reliable, and resilient grid of the future," according to the DOE announcement. CSP concepts and technology solutions supported by the latest funding opportunity will be aimed at enabling the solar industry to reach DOE’s 2030 levelized cost of electricity (LCOE) targets for CSP, including $0.05 per kilowatt-hour for systems with greater than 12 hours of onsite storage. Research in this area will focus on advancing elements found in CSP subsystems, including collectors and thermal transport systems for advanced power cycles. 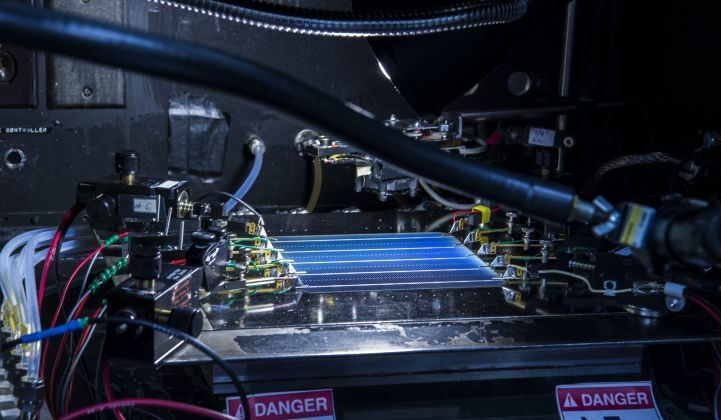 In the PV segment, DOE is looking to support early-stage research aimed at increasing the performance, reducing materials and processing costs, and improving the reliability of PV cells, modules and systems. These projects support DOE’s efforts to lower LCOE for utility-scale PV systems to $0.03 per kilowatt-hour by 2030. Based on national labs data, that's roughly half the cost of utility-scale solar today. "Secretary Perry's announcement today is yet another positive step in strengthening this important public-private relationship between the federal government and the American solar industry," said Abigail Ross Hopper, the President and CEO of the Solar Energy Industries Association. "We look forward to fulfilling this opportunity with innovative solar projects that drive America's energy economy to a cleaner, more affordable and reliable future." For those interested in applying, mandatory letters of intent for all topics are due on May 4 and mandatory concept papers are due by May 9. Separately, the DOE announced up to $20 million in funding on Wednesday for nine projects to advance early-stage solar power electronics technologies. "As the critical link between PV arrays and the electric grid, advances in power electronics can also help grid operators rapidly detect and respond to problems, protect against physical and cyber vulnerabilities, and enable consumers to manage electricity use," according to a press release. "Advanced solar power electronics can also help deliver power safely, integrate PV with storage controls, and ensure power reliability." Each of the nine projects must meet a 20 percent cost share requirement and last up to three-years. The power electronics awards are cooperative agreements — rather than grants — which involve substantial federal oversight and technical milestones. Georgia Institute of Technology – Atlanta, Georgia. This story was updated to note the $20 million in funding for solar power electronics technologies.